Add full-featured navigation to your laptop or ultra mobile PC with Garmin Mobile PC. Get maps, millions of POIs, easy-to-use navigation software, turn-by-turn directions that speak street names (English only), route planning and more — all from the trusted leader in GPS navigation, Garmin. Packed with preloaded maps, millions of destinations and full GPS navigation capabilities, Garmin Mobile PC software turns your laptop into a powerful street navigator. Its intuitive interface greets you with two simple options "Where to?" and "View Maps." Easily look up addresses and services and get turn-by-turn directions that announce the names of exits and streets to your destination. Also receive automatic corrections if you stray off course. With Garmin Mobile PC, you can upload custom points of interest, such as safety cameras, and conveniently navigate to Outlook® Contacts. Garmin Mobile PC includes advanced navigational features to take the worry out of traveling. With route planning you can save routes, specify via points and preview simulated turns on your computer. In addition, Garmin Mobile PC automatically sorts multiple destinations to provide an efficient route for errands, deliveries or sales calls. A trip computer automatically records trip data, and a trip log provides an electronic bread crumb trail, so you can see where you've been on the map. Even avoid certain roads or areas. Check the weather, gas prices, your flight status and hotel information when you travel¹ with your laptop and Garmin Mobile PC. Get the weather forecast for your location or anywhere in the world. View hotel rates, ratings and amenities information from hotels.com. Check the status of your flight along with departure and arrival information. Even compare local gas prices when out and about. These free, real-time services from Garmin Online™ put essential travel information at your fingertips. 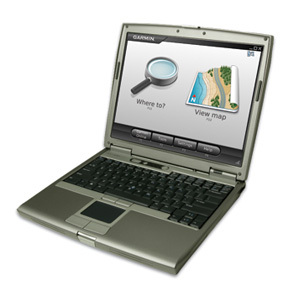 Garmin Mobile PC is available with or without a GPS sensor depending on your laptop configuration² (see versions tab). 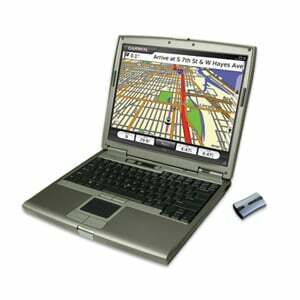 Purchase Garmin Mobile PC software on DVD if your laptop already has an internal GPS receiver. For laptops without GPS, purchase Garmin Mobile PC bundled with the GPS 20x sensor, a sleek, thin, high-sensitivity GPS receiver with a USB connection. Garmin Mobile PC: Garmin GPS navigation for your laptop. ¹Fuel prices and hotel information available for North America only. 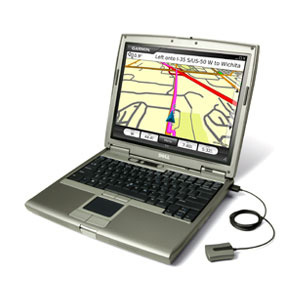 ²Garmin Mobile PC (software only) can be used on a single laptop with a NMEA compatible GPS receiver. Windows® 2000 SP2, Windows XP, Windows Vista® or Windows 7 platforms, 256 MB RAM, at least 800 x 480 display, 1.5 GB free disk space, USB port, DVD drive. Microsoft® Outlook® 2002 or newer required for contact integration. Internet connection required for Garmin Online™ features. Includes USB device drivers. Works on tablet PCs and ultra-mobile PCs with or without touchscreens. ¹Garmin Mobile PC with GPS 10x product only may be used with the included GPS 10x sensor. Please purchase a Garmin Mobile PC (software only version) for each additional sensor you own. ²Garmin Mobile PC with GPS 20x product only may be used with the included GPS 20x sensor. Please purchase a Garmin Mobile PC (software only version) for each additional sensor you own.